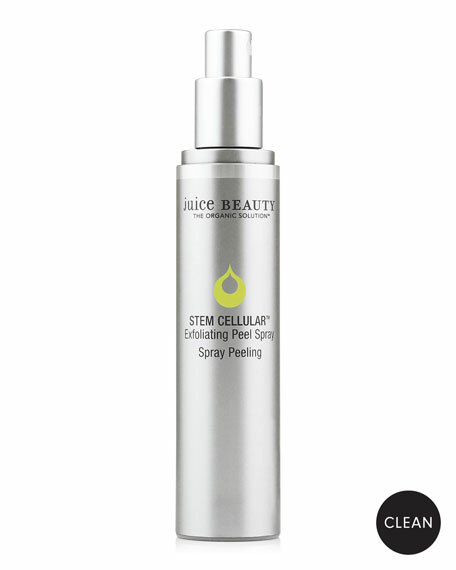 Juice Beauty's STEM CELLULAR Exfoliating Peel Spray is ideal for all skin types and has been specially formulated for those looking for an instant treatment to minimize the appearance of fine lines & wrinkles. Not suitable for sensitive skin types. Ophthalmologist-tested and safe for contact lens wearers. 100% of participants reported softer & smoother skin. 83% of participants reported more radiant looking skin. 83% of participants agreed the formula is an effective exfoliator. *Third party lab consumer panel test after one application of STEM CELLULAR Exfoliating Peel Spray. Study conducted amongst 30 female participants, 65% of whom wore contact lenses. Individual results may vary. ** Third party reported results based on D-Squame® exfoliation evaluation after one application of STEM CELLULAR Exfoliating Peel Spray. Individual results may vary.